I've used the Fitbit for one full week and my results were as such. I get a helluva lot more exercise on days when I'm at work than on days that I have off. I need to get some gym time in or some jogging to bridge that gap. I went for a morning walk/Jog 4 days last week and would have made it 5 in a row but I stayed out late playing poker and then only got a 4.5 hour nap and just never had the energy to do it. For my first week I'll take it. There were several instances where I went out of my way to get some extra walking in. At first I set my goal to be 10,000 steps per day but after seeing how many I got in the 1st day that I worked with it I upped my goal to 12,000. I will be continuing to increase it as I hit my goal more consistently and start getting more exercise. I had some other info written up but I think I left it on my work email. So, once I transfer that to my personal email I'll have a more in depth post on the Fitbit and how it fits into my life currently. Also, I stole this from an online forum so don't think of me as original or anything. In order to motivate myself to walk more and get in more exercise I am giving myself one dollar for every mile I put in via my Fitbit. So, this past week I did 32 miles and now I owe myself $32. This is purely fun money that I can do whatever I want with. This will be the money where I earn my video games or movies or whatever. If I notice that I am doing too much and therefor giving myself too much spending money I'll cut it down to a dollar every 1.5 miles or ever 2 miles, but for August it will be for every mile traveled. Tomorrow I expect to not only get in my normal half mile walk/jog but I also plan on hitting up the elliptical at Golds Gym for about 30-45 minutes. 1st time under 220 in over a decade! I've got everything going for me, including motivation. I want to look amazing for my wedding and my wife. I want to be healthy for my children. I have bad genetics that will F me over if I don't keep it under control as much as possible. My doctor said I have to. nice . motivation is a big part of it,bro. I had "wanted" to lose weight for at least a decade but only ever did something about it in small amounts and then gave up. This is the longest I have ever been dedicated and at this point it's all about just changing my life to be healthier and live better. Good work. Walking is the nuts. When you plan to play at ballys, park elsewhere and walk to the poker room. Voila, playing poker = exercise :)... Always + EV. When I play at Bally's I always park behind the building in the parking lot. I never use the Garage. I also park there when I play at Planet Hollywood or Harrah's or any of those surrounding casino's for that matter. Now that I read this, I'm thinking I should try to get down to 210 pounds by October. I lost some weight hiking in the mountains a couple weeks ago. I'm sitting at 222 right now, and would enjoy a little less "spare tire" around the mid section. We are both sitting at about the same weight. I'm visiting a friend in October who is a little under 210 and I secretly want to be where he is at. Last time he saw me I was 260+ so this will be a huge surprise. he knows I"m losing weight but hasn't ever seen me this small. We could do a little friendly competition. We'll agree to weigh in the day before you fly out. Take a pic of the scale - whoever is smaller buys a, relatively, cheap dinner. Personally - if you win (and are a burger guy) I offer to buy burgers from Gordon Ramsey's BurGR place in Planet Hollywood (since I'm dying for an excuse to go there). Since Gordon Ramsey's BurGR place is the place to go. That's where we will go. Is the smaller guy paying, or the bigger guy? You may have the edge on me with already having a work out routine. I may have the edge in not having a workout routine. If I can get motivated I could drop a few pounds quickly. Luckily my wife is wanting to start riding bikes on Wed Thurs and Fri evenings while my niece pushes a jogging stroller. I may just jog too. Looks like water and jogging from here until October. 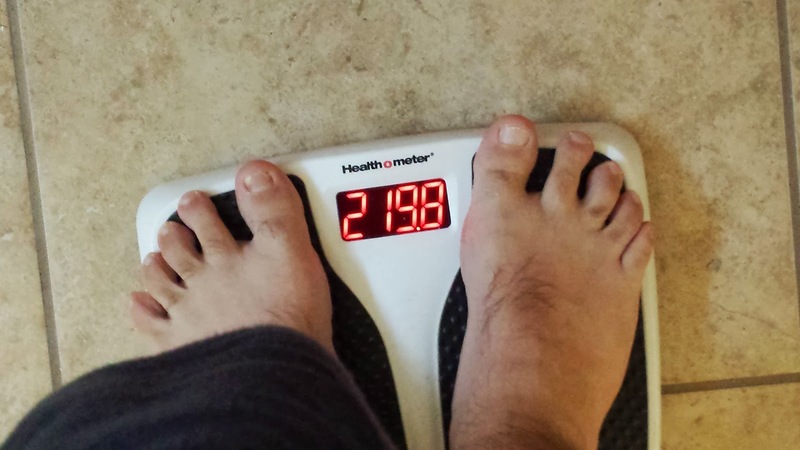 I'll have to work hard to get to 210 or below by then. I haven't been that small since college. Whoever loses the Least should pay. So you said you were 222 and I was sitting at 220. Both of us will have to be very motivated to get below 210 - it's definitely a challenge. Once I got down to 235 every incremental drop has been harder and harder. I'll lose 5 and then stay there for a month or two before losing another 5. If you are looking for the best Bitcoin exchange company, then you should use CoinMama.